The seasonally adjusted Caixin China Manufacturing PMI dropped to 48.3 in January from 49.7 in December. It was the lowest reading since February 2016. Analysts had predicted a much smaller decline to 49.5. Meanwhile, the Australian Bureau of Statistics reported that the Producer Price Index rose 0.5% in the December quarter from the previous three months, in line with expectations. The Reserve Bank of Australia reported that the commodity price index increased 6.9% in January from a year ago, led by rising prices for liquid natural gas, iron ore, and alumina. The Australian Industry Group Australian Performance of Manufacturing Index advanced to 52.5 in January (seasonally adjusted) from 50.0 in December. 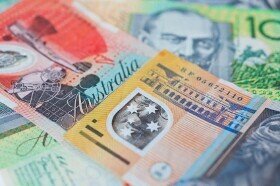 AUD/USD edged down from 0.7273 to 0.7256 as of 10:23 GMT today, touching the low of 0.7237 intraday. EUR/AUD climbed from 1.5730 to 1.5804. AUD/JPY slipped from 79.18 to 79.04, while its daily low was at 78.73.